Hi everyone! I've recently installed the Shiva 3D Web Engine and started to work on a little project, in order to get familiar with it. I've got a small problem regarding the textures on the terrain. They're simply not getting rendered. I do not know what the problem is. I can only assume that there is a problem with the graphics card. But when I open The Hunt and view it's scene the texures are rendered on the terrain. So the assumption that there could be a problem with the graphics card is no more valid. I am struggling to find a sollution. Could you please help me to find a way to solve the problem? I am waiting for your advices. Let me know if this helps or if you need further assistance. Unfortunately it doesn't work. I have followed all steps but i have come to no result. It think the problem may be with the Video Card. I work on an old PC with an Intel Xtreme Graphics card. Should I adjust some settings of the Video Driver? Could it there be a problem? What do you mean by "rather time-consuming process"? TheBlueSnow wrote: What do you mean by "rather time-consuming process"? after pressing the button, the editor takes time to render the textures. the better the quality, the longer it takes. that's what i mean by "time consuming process". Hello there! I have done exactly the way you described. I've selected all chunks, and clicked production. But nothing seems to happen. The terrain looks untextured. This is why i assumed there could be a problem with the Graphics Card. A warning message is being desplayed bottom right. It says, that the XInput library may not be installed. Could this warning message be linked wiht my problem? Since you reported that terrain textures are rendered just fine in TheHunt, I don't think it is a hardware problem. XInput is a library related to game controllers, the Xbox 360 pad in particular. You must be running a rather old version of Windows that this is not included by default. In any case, it has nothing to do with terrains. I have posted a video on youtube: https://www.youtube.com/watch?v=BAz6JSKlpGE. Please, tell me where the problem is. Thanks for that video - that was very helpful. I don't see anything wrong with what you are doing. When i duplicate your steps, the terrain textures come out fine. 1. When the terrain textures get rendered, you should get an output in the log. Please switch over to the "Log Reporter" and check on your textures. Do you get any output? 2. The textures with the names shown in (1.) should be TGA files inside your "projectroot\\Resources\\Textures" folder. Do they exist, and do they contain any data? 3. Try lowering the texture resolution of your terrain maps and then re-generate them. The default is 1024x1024, which should be at the upper limit of what your GPU can handle. Try 256x256 next. Hi! Thank you for you answer! I do get some output in the LOG Reporter. 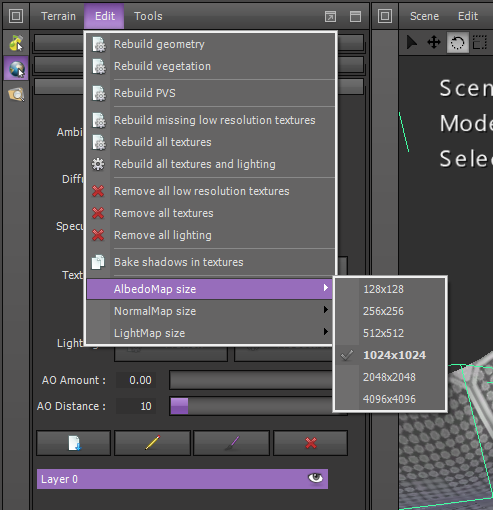 I can find the textures in the "projectroot/Resources/Textures", but they do not have the TGA extension. They have got the TMP extension. I have reduces the texture resolution down to 256x256 but nothing seems to happen. Any file formats beside TMP? How about DDS? If you only see TMP, then the texture generation never finished successfully. There has to be another file format for you to see anything.